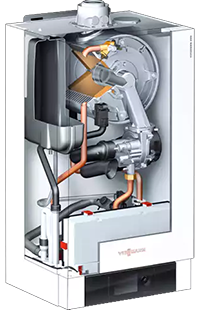 The Vitodens 200-W is a flexible and efficient wall mounted gas condensing boiler from Viessmann. It’s the ideal boiler for flats, detached houses and apartment buildings, and it can be easily wall mounted in a recess in the bathroom or in a kitchen cabinet. It boasts an Inox-Radial heat exchanger made of high grade stainless steel which guarantees reliability and permanently high condensing efficiency. The Viessmann Vitodens 200-W consumes less energy, as it also makes use of the latent heat in the flue gases. This means it has a high rate of conversion of spent energy to heat of up to 98 percent and energy efficiency class A. When combined with solar collectors or modulating remote control units, the next higher efficiency class A+ is achieved. It also incorporates an environmentally responsible MatriX cylinder burner. These features combined means that this boiler is perfect for reducing a homeowner’s energy costs. The Vitodens 200-W features a Vitotronic 200 control unit with colour touchscreen, to make it easy for the user to control their home heating. Both users and contractors can benefit from this control unit, which is delivered via the bright 5 inch colour touchscreen, plus the control wizard simplifies commissioning of the boilers after installation. The energy cockpit also featured in these controls indicates gas and electricity consumption of the heat source directly on the display. Interested in learning more about the Vitodens 200-W?